Let us tell you the story of our land. One of the most fertile of the world. It was in Normandy that all started, specially in Luneray, town naturally rich in chalck, clay and flint stones, marl and silt which makes this part of France incredibly fertile. Add to that an oceanic climate you will get the best vegetables in the world! It is therefore natural that farmers' families cultivate real vegetables made in Normandy there! 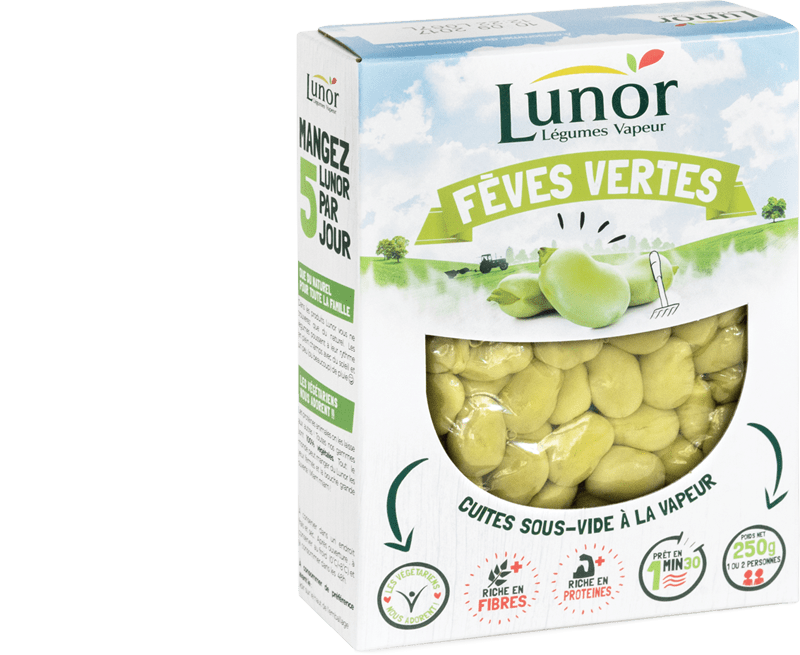 Farmers, families, friends, all lovers of the region and all lovers of vegetables,it is all you find behind the Lunor vegetables. In 1956, a group of fifteen farmers decided to take their future in hand. One goal: create a brand to commercialise their production of potatoes. An invention which revolutionised the vegetable. 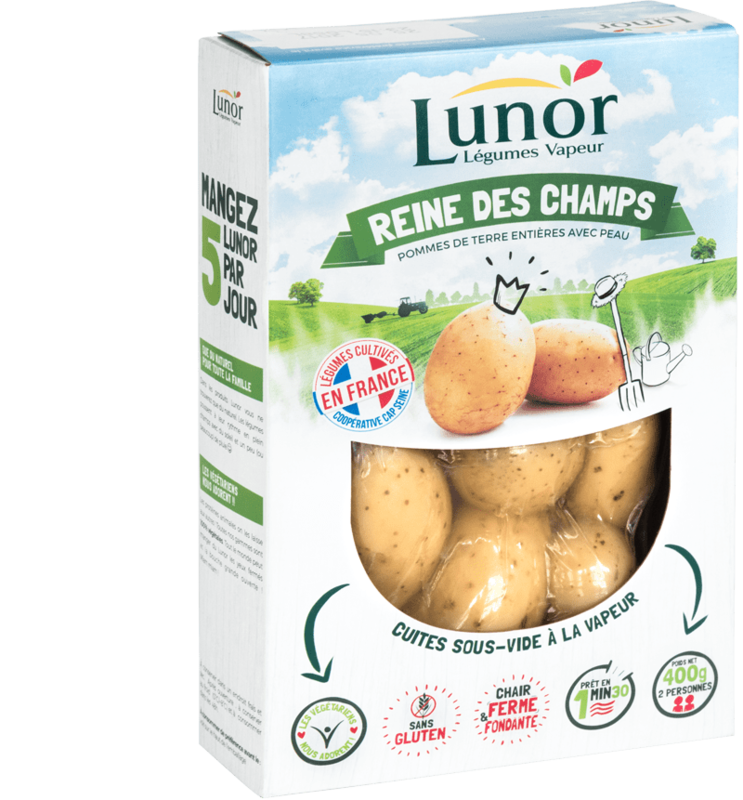 After several years of research, Lunor has developed a process allowing to commercialise whole baby potatoes that previously were not valued. This process involves cooking vacuum steamed vegetables: a new method of cooking was born. The success was immediate. Today, millions of bags are sold throughout France and around the world. All the cooperative is proud to be at the origin of convenience produce. This is how convenience produce were created by Lunor, a real success! Passionated about our lands, we are necessarily attached to the ecology. Thus, since the brand's creation, we pay particular attention to our production in order to be respectful of environment. Recycling of water, processing of peelings, methanation, we constantly innovate! You will not resist the best of nature. Why add something when everything is perfect? Vegetables grow at their own rhythm in the fields with sun and a little (or a lot) of rain. No animal protein trace in our produce. 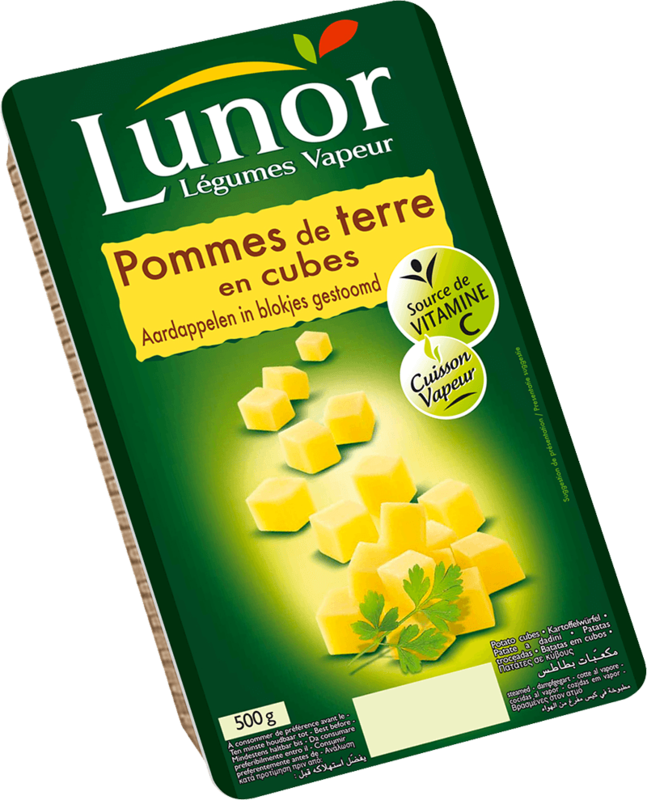 Lunor is vegetable and only vegetable, both in our range "essentials" and "prepared". 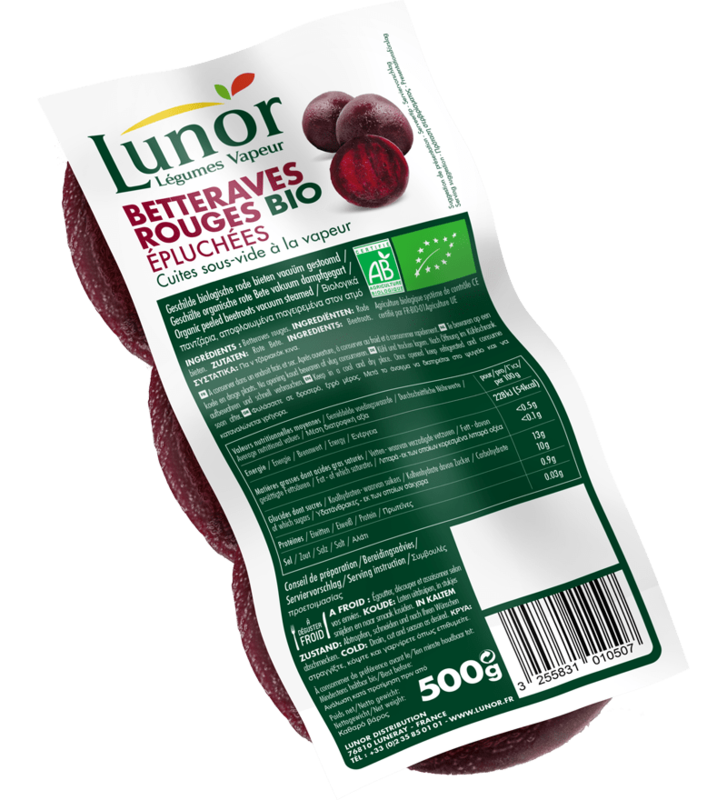 Everyone can eat Lunor produce with eyes closed! The steam is THE healthiest cooking method. That's good, it's Lunor's! With a perfect reproduction of the organoleptic and nutritional qualities you will find in our vegetables all the vitamins, fibers and minerals that your body needs. With Lunor, vegetables are funny! A large range of vegetables for the whole family. "You will have no more excuses! We have taken care of everything: peeling, cutting, cooking ... We have minimized your preparation time to make your life easier. 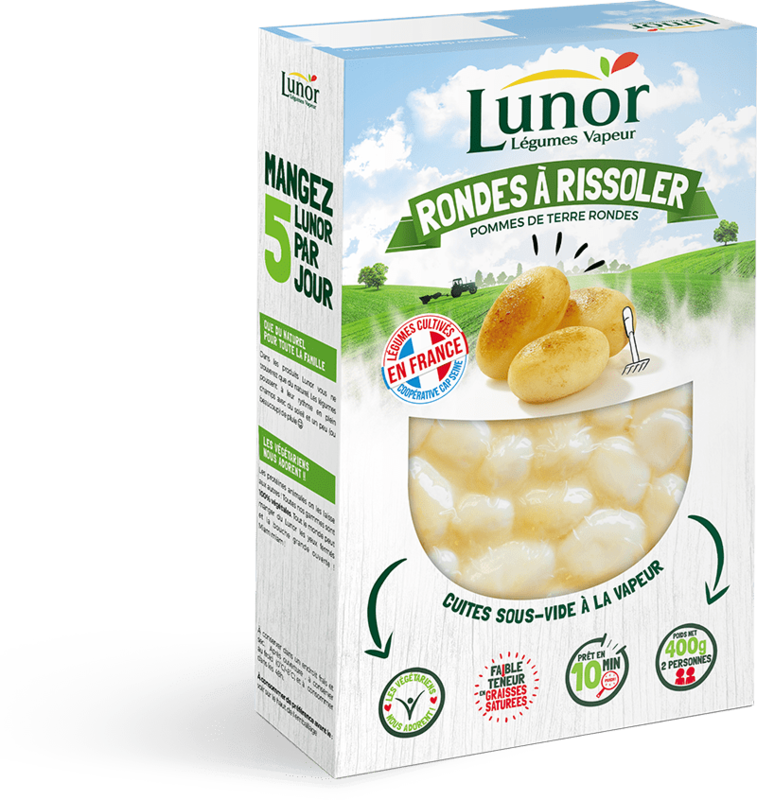 We can all eat 5 Lunor a day!" Let yourself be tempted by our carefully prepared vegetables. a ready-to-cooked natural range. let free your imagination. you don’t have time for cooking, but you love that is good? this range is for you! from traditional cooking to exotic dishes, if all vegetables are at lunor, flavours too! Are you a big family? Vegetables for everyone! 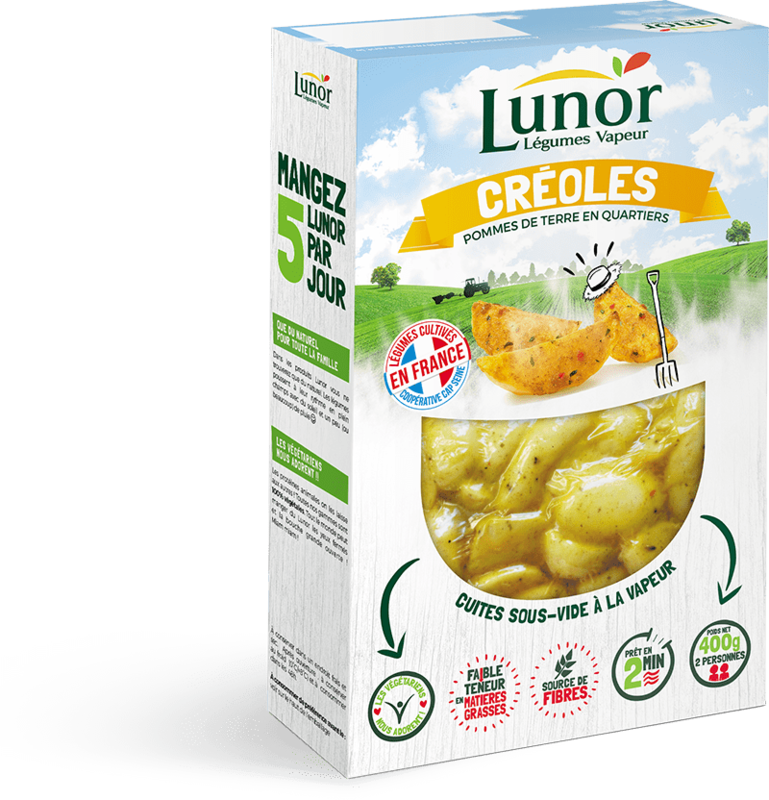 With our big bags, enjoy lunor vegetables with your family and your friends. Discover a large vegetable range adapted to your professional needs. Perfect to go with meat and fish dishes. Microwave: Season, cover and heat for 1 min 30 on high power (900W) into a microwavable dish. Frying pan: Cut in quarters and sauté with some fat on high temperature. Mix during 5min and season. Cold: Cut and season as desired. Once opened, keep at cold temperature (0°C/+8°C) and consume within 2 days. Perfect to mix with cereals for eating a full dish or cold in salad. Microwave: Cover and heat for 1 min 30 on high power (900W) into a microwable dish. Saucepan: Place into a saucepan with some water and heat for 3 min on low power. Cold: Drain and season as desired. Perfect to use in salad or cold starters. Potatoes, water, salt, antioxidants: ascorbic acid (E300), sodium disulphite (E223). Microwave: Rinse and drain. Place into a microwavable dish, season and heat for 2 min on high power. Oven: Rinse and drain. Place into an oven dish with some fat, season and heat for 10 min at 220°C. Frying pan: Rinse and drain. Add some fat to the pan and fry for 5 min over a medium heat and season. Carrots, antioxidants: ascorbic acid, citric acid. Microwave: Place into a microwavable dish, season and heat for 2 min on high power. Saucepan: Place into a saucepan, season and heat for 5 min on low power. Leeks, salt, antioxidants: ascorbic acid, citric acid. Microwave: Drain well. Place into a microwavable dish, season and heat for 2 min on high power. Oven: Drain well. Place into an oven dish with some fat, season and heat for 15 min at 220°C. Frying pan: Drain well. Add some fat to the pan and fry for 2 min 30 on a medium heat and season. Perfect to use in gratin. Endives, water, antioxidants: ascorbic acid, citric acid. Microwave: Drain well and remove any access water with a kitchen towel. Place into a microwavable dish, season and heat for 3 min on high power. Oven: Drain well and remove any access water with a kitchen towel. Place into an oven dish with some fat, season and heat for 15 min at 200°C. Frying pan: Drain well. Add some fat to the pan and fry for 4 min on low power, stir half way through and season. Perfect to go with meat dishes or in salad. Lentils, salt, natural flavouring. May contain traces of wheat. Microwave: Place into a microwavable dish and heat for 2 min on high power. Saucepan: Place into a saucepan with some water and heat for 5 min on low power. Cold: Rinse, drain and season as desired. Perfect to go with meat dishes. Red kidney beans, salt, natural flavouring. May contain traces of wheat. Flageolet, salt, natural flavouring. May contain traces of wheat. Perfect to go with meat dishes, fish dishes or making desserts. Microwave: Rinse and drain. Place into a microwavable dish and heat for 3 min at 350 W.
Frying pan: Rinse and drain. Sauté with fat over medium heat for 4 min. Cold: Drain, cut and season as desired. To reheat and enjoy as it is! Open the pouch and heat the cobs for 3min on the grill. Perfect to go with meat dishes or stir fry with others vegetables. Frying pan: Without any fat, let brown over medium heat by moving regularly during 10 min. Oven: For more flavour, place into an oven dish and heat for 15 min at 220°C. Microwave: Rinse and drain. Place into a microwavable dish, season and heat for 2 min 30 on high power. Oven: Rinse and drain. Place into an oven dish with some fat, season and heat for 15 min at 220°C. Potatoes, water, salt, antioxidants, sodium disulphite. Microwave: Rinse and drain, place in a microwavable dish, season, cover and heat for 2 min 30 on high power. Oven: Rinse and drain, place in a dish with some fat, season and heat for 15 min at 220°C. Frying pan: Rinse and drain, add some fat to the pan and fry for 8 min over a medium heat, then season. Frying pan: Drain and dry. Sauté with butter during 5 min and season as desired before serving. Oven: Drain. Place into an oven dish with some butter or cream and heat at 200°C during 15 min. Season as desired. Salt 0.435g (salt exclusively due to the presence of sodium naturally present in the product). Ce site est le site internet institutionnel de la société LUNOR. Les informations contenues dans ce site sont soumises à la loi française et sont fournies ” telles quelles ” sans garanties d’aucune sorte, ni explicites ni tacites. Ces informations peuvent contenir des inexactitudes techniques ou des erreurs typographiques. Elles sont non contractuelles et sujettes à modification sans préavis. 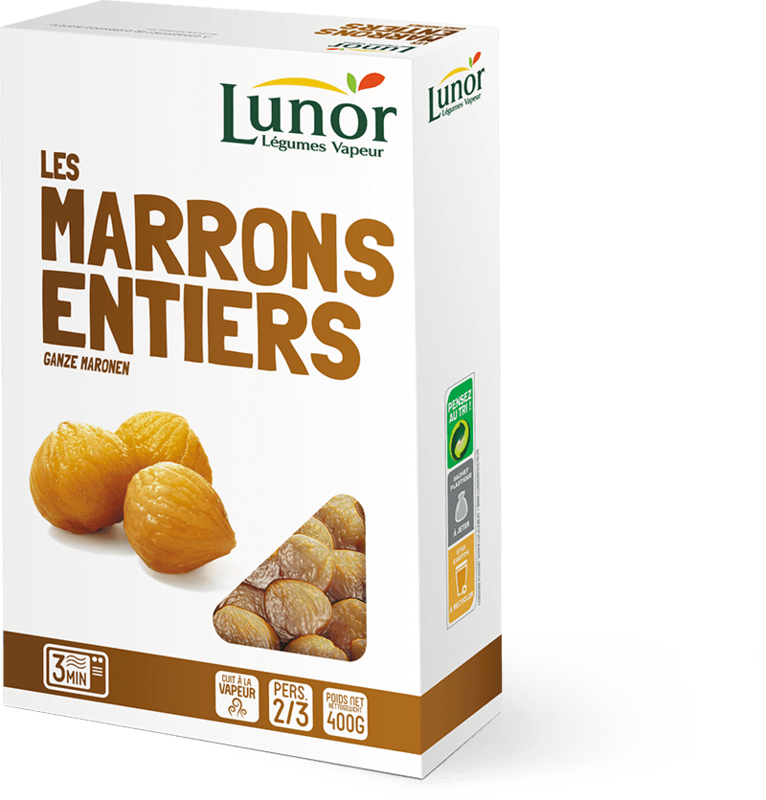 L’ensemble des contenus, pages, scripts, icônes ou sons de ce site sont la propriété exclusive de LUNOR. Toute production, reproduction ou représentation de ce site, en tout ou partie (textes, sons ou images), sur quelque support que ce soit est interdite. Le non-respect de cette interdiction constitue une contrefaçon pouvant engager la responsabilité civile et pénale du contrefacteur. 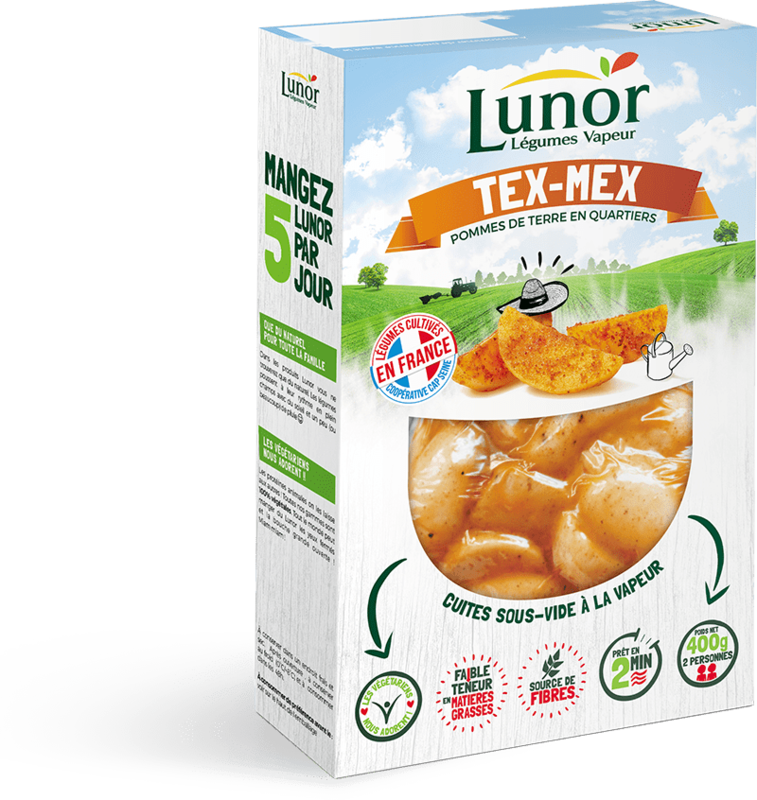 Il est strictement interdit d’utiliser ou de reproduire le nom “LUNOR” ou son logo, seuls ou associés, à quelque titre que ce soit et notamment à des fins publicitaires sans l’accord préalable écrit de LUNOR. 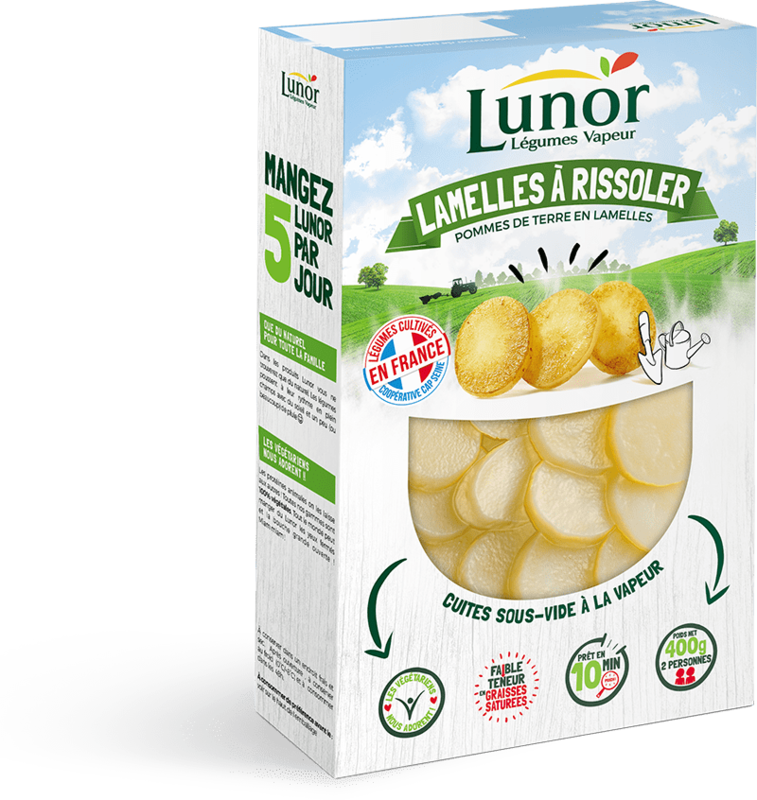 LUNOR n’est pas responsable du contenu de tout autre site auquel vous pourriez avoir accès via le site de LUNOR. Il est expressément entendu par l’utilisateur de ce site qu’en aucun cas LUNOR ne peut être tenu responsable des dommages quelconques, directs ou indirects, matériels ou immatériels ou spéciaux, résultant notamment de la consultation et /ou de l’utilisation de ce site internet ou d’autres sites qui lui sont liés, comme des utilisations d’informations textuelles, sonores ou visuelles qui auraient pu y être recueillies et notamment de tout préjudice financier ou commercial, de pertes de programmes ou de données dans son système d’informations ou autre. L’accès à ce site peut donner lieu à l’installation de “cookies” sur l’ordinateur de l’utilisateur. Un Cookie permet l’identification de l’utilisateur, la personnalisation de sa consultation du site, et l’accélération de la mise en page du site grâce à l’enregistrement d’un fichier de données sur son ordinateur. Concernant l’enregistrement de Cookies, l’utilisateur reconnaît être prévenu de cette pratique et autorise LUNOR à y procéder. 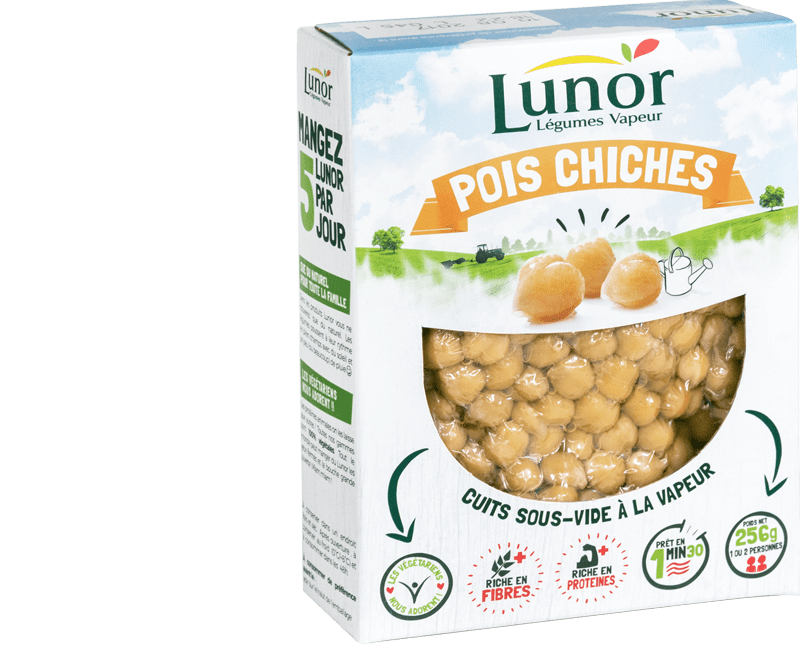 La société LUNOR s’engage à ne jamais communiquer le contenu de ces Cookies à des tierces personnes, sauf en cas de réquisition légale. L’utilisateur a la possibilité de refuser l’enregistrement de Cookies ou configurer son ordinateur pour être prévenu préalablement à leur installation. Pour ce faire, l’utilisateur procédera au paramétrage de son navigateur. © Copyright LUNOR, Tous droits réservés. Fill all required fields following by a "*". Attached document(s) Authorized documents: pdf, jpeg and png limited to 3 Mo.